Outline map of Canada's census divisions in 2001. Canada's second-level geographic units are called "census divisions." In terms of size, they generally lie between the top-level administrative divisions of the province and territory and third-level administrative divisions such as sections, townships and ranges. Census divisions are divided into census subdivisions (see section below). Saskatchewan Census divisions consist of groups of municipalities such as cities, municipal districts, and rural municipalities. Each census division is numbered. British Columbia Census divisions correspond with regional districts or municipalities. Prince Edward Island Census divisions correspond with counties. Newfoundland and Labrador Census divisions are delineated without reference to administrative or other forms of division and are numbered. 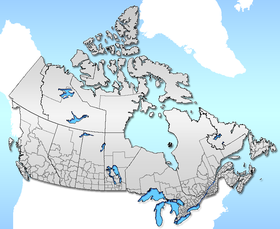 Northwest Territories Census divisions do not correspond with the administrative regions of the Northwest Territories. Nunavut Census divisions correspond with the administrative regions of Nunavut. Ontario Census divisions consist of "upper-tier" municipalities (counties, districts, regional municipalities, single-tier cities). Quebec Census divisions mostly correspond to regional county municipalities or equivalent territories. Yukon A territory treated as a single census division. In Ontario, Haldimand County and Norfolk County are grouped as a single census division, as are Brant and Brantford. In Quebec, 93 of 98 census divisions correspond precisely to the territory of one regional county municipality (with the addition of Indian reserves, which do not legally belong to RCMs) or a "territory equivalent to an RCM" (which usually corresponds to a single independent city). However, there are five census divisions consisting of two or three RCMs or equivalent territories each. See List of census divisions of Quebec. In almost all such cases, the division in question was formerly a single unit of the standard type, which was divided into multiple units by its province after the Canada 2001 Census. A census consolidated subdivision is a geographic unit between census division and census subdivision. It is a combination of adjacent census subdivisions typically consisting of larger, more rural census subdivisions and smaller, more densely populated census subdivisions. Census subdivisions generally correspond to the municipalities of Canada, as determined by provincial and territorial legislation. They can also correspond to area which are deemed to be equivalents to municipalities for statistical reporting purposes, such as Indian reserves, Indian settlements, and unorganized territories where municipal level government may not exist. Statistics Canada has created census subdivisions in cooperation with the provinces of British Columbia, Newfoundland and Labrador, and Nova Scotia as equivalents for municipalities. The Indian reserve and Indian settlement census subdivisions are determined according to criteria established by Indigenous and Northern Affairs Canada. Dissemination areas are the smallest standard geographic unit in Canada and cover the entire country. As small areas, they comprise one or more dissemination blocks and have a population between 400 and 700 people. See template below for links to census metropolitan areas by size. A "census metropolitan area" (CMA) is a grouping of census subdivisions comprising a large urban area (the "urban core") and those surrounding "urban fringes" with which it is closely integrated. To become a CMA, an area must register an urban core population of at least 100,000 at the previous census. CMA status is retained even if this core population later drops below 100,000. CMAs may cross census division and provincial boundaries, although the Ottawa-Gatineau metropolitan area in Ontario and Quebec is the only one that currently crosses a provincial border. The methodology used by Statistics Canada does not allow for CMA-CMA mergers into larger statistical areas; consequently, there is no Canadian equivalent to the Combined Statistical Areas of the United States. Statistics Canada has stated that Toronto, Oshawa and Hamilton could be merged into a single CSA were such an approach utilised. Statistics Canada has described the Greater Golden Horseshoe as the country's largest urban area. A "census agglomeration" (CA) is a smaller version of a CMA in which the urban core population at the previous census was greater than 10,000 but less than 100,000. If the population of an urban core is less than 50,000, it is the starting point for the construction of a 'census agglomeration'. CMAs and CAs with a population greater than 50,000 are subdivided into census tracts which have populations ranging from 2,500 to 8,000. "Population centre" redirects here. For other uses, see Center of population. A population centre (PC), formerly known as an urban area (UA), is any grouping of contiguous dissemination areas that has a minimum population of 1,000 and an average population density of 400 persons per square kilometre or greater. For the 2011 census, urban area was renamed "population centre". In 2011, Statistics Canada identified 942 population centres in Canada. Some population centres cross municipal boundaries and not all municipalities contain a population centre while others have more than one. A "designated place" (DPL) is usually a small community that does not meet the criteria used to define incorporated municipalities or urban areas (areas with a population of at least 1,000 and no fewer than 400 persons per square kilometre), but for which Statistics Canada or a provincial government has requested that similar demographic data be compiled. A "locality" (LOC) is a historical named location or place. The named location may be a former census subdivision, a former urban area, or a former designated place. It may also refer to neighbourhoods, post offices, communities and unincorporated places among other entities. ^ Statistics Canada. "Illustrated Glossary: Census Geography". Retrieved 2006-10-11. ^ Sometimes used for municipal organization or as health regions. ^ "Census consolidated subdivision (CCS)". Statistics Canada. 2012-01-31. Retrieved 2012-02-18. ^ a b "Census subdivision (CSD)". Statistics Canada. 2010-06-14. Retrieved 2011-08-29. ^ "Interim List of Changes to Municipal Boundaries, Status, and Names" (PDF). Statistics Canada. April 2011. p. 7&8. Retrieved 2011-08-29. ^ "More information on Census subdivision (CSD)". Statistics Canada. 2011-04-04. Retrieved 2011-08-29. ^ a b "2006 Census Dictionary: Dissemination area (DA)". Statistics Canada. 2009-11-20. Retrieved 2011-09-21. ^ "Defining and Measuring Metropolitan Areas: A Comparison between Canada and the United States". Statistics Canada. 2008-11-17. Retrieved 2014-05-19. ...application of the American combination criteria could result in the consolidation (combining) of the CMAs of Oshawa and Hamilton with the Toronto CMA. ^ "2006 Census: Portrait of the Canadian Population in 2006: Subprovincial population dynamics". Statistics Canada. Retrieved 2014-07-11. In 2006, nearly half of all Canadians, 13.9 million people, were living in the country's three largest urban areas: the Montréal census metropolitan area, the Vancouver census metropolitan area, and the Greater Golden Horseshoe in southern Ontario. ^ Sancton, Andrew. "Canadian Local Government: An Urban Perspective" Pp. 74. Oxford University Press, 2011. ^ a b c "Population centre (POPCTR)". Statistics Canada. 2011-05-05. Retrieved 2011-09-21. ^ "Preview of Census Products and Services: Highlight tables". Statistics Canada. 2012-04-12. Retrieved 2013-08-08. ^ Sancton, Andrew (2011). Canadian Local Government: An Urban Perspective. Canada: Oxford University Press. p. 73. ISBN 978-0-19-542756-1. ^ "2006 Census Dictionary: Designated place (DPL)". Statistics Canada. 2009-11-20. Retrieved 2011-12-22. ^ "2006 Census Dictionary: Locality (LOC)". Statistics Canada. 2009-11-20. Retrieved 2011-12-23. Reference maps for census divisions at Statistics Canada. This page was last edited on 3 January 2019, at 13:19 (UTC).